Chicken 65 recipe at last! Isn’t that the reaction of many of you dear readers? 🙂 I know that you have patiently waited for the recipe of chicken 65. There have been numerous requests for this chicken starter recipe and somehow I never got down to blogging it. 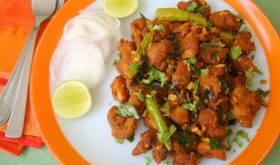 This is one of the most popular Indian chicken starter recipe and being able to re-create restaurant style chicken 65 at home, successfully, gives one a high. A favorite appetizer in our home along with Chicken Manchurian. The key to this recipe is use of yogurt and sauteeing the fried chicken in spiced yogurt till the liquid is completely absorbed. There are numerous theories doing the rounds on the internet on the origins of Chicken 65. Whatever the real story, must thank the creator of this delicious chicken starter recipe. Yogurt/Curd is essential ingredient. It gives the chicken texture and flavor. By Sailu Published: May 27, 2012 Chicken 65 recipe at last! Despite numerous requests on how to make chicken 65, I never got down to blogging it until today. Is it possible to pan fry instead? Lovely recipe. One of the best starter. ur recipes any books or dvds is available. Pls advise whether your teaspoon/tablespoon etc. measurements are American, English or Indian which is the same as English? Please go through this post on Kitchen measurement cups and spoons. whether egg should be beaten before adding or just break and add? Just break and add and mix well. Irresistible and super tempting chicken 65. Have a fun vacation! Any forthcoming mushroom recipes from you Sailu (preferably Indian)? Pretty weird name but certainly something to love. Have you tried using shimla mirch powder? Today i tried ur recipie it came out very tasty and delicious. Thanks 4r the recipie. I’m fan of ur blog. can i use plain flour instead of corn flour?thank u. Looks a bit like a dish that is sometimes named ‘Chicken Tikka Masala’ … although there are lots of varieties. Very nice recipe! Tried this twice – came out awesome!! 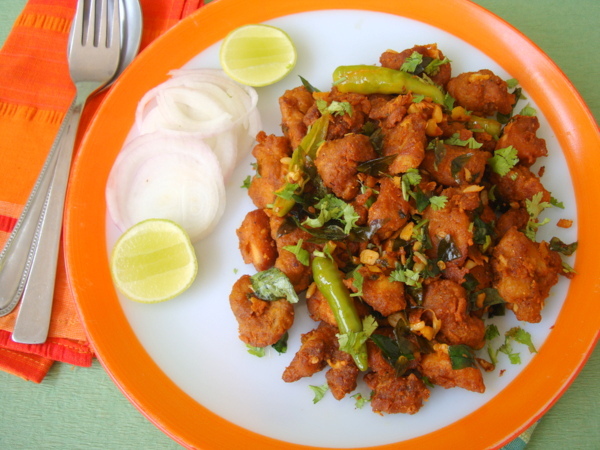 Thank you for posting such easy-to-follow and precise recipes – any plans for a book on Andhra cooking? I will be first in line, I promise!! Looks so simple yet spicy. So easy to prepare. Try also visiting my favorite site, GOURMANDIA. They have lots of exciting and interesting recipes for you to choose from. Not only that, they have lots of recipe videos for you to watch and replay. Like them also on FACEBOOK and TWITTER. I made this yesterday and it was delicious, thank you. I will second the question posed by another reader about whether we can saute/stir fry the chicken instead of frying it. I can’t legitimately keep making this for my family if it’s deepfried (although it is tasty). You can pan fry the chicken too. I tried this recipe this weekend and it turned out very delicious…my husband couldnt stop appreciating…thnk u for this wonderful recipe. It came out delicious. Thanks! thank u for ur recipe.. really this is very useful for us like newly wedded… just now i make it note. tomorrow morning for the first time in my life i am going to prepare this delicious recipe.. wish me all the best.. I pan fried the chicken.The outcome was no different from the deep fried version. How much yoghurt please mention. I think the yoghurt will make the chicken soft right??? A little less than 1/2 cup. Can I substitute rice flour with something else? Omit it if you do not have it on hand. can you suggest how it can be done in a oven. atleat the frying part. Beat the curd really well and saute well such that no spots of curd appear. Hi, great recipe, but can egg be substituted as my husband is allergic to it. 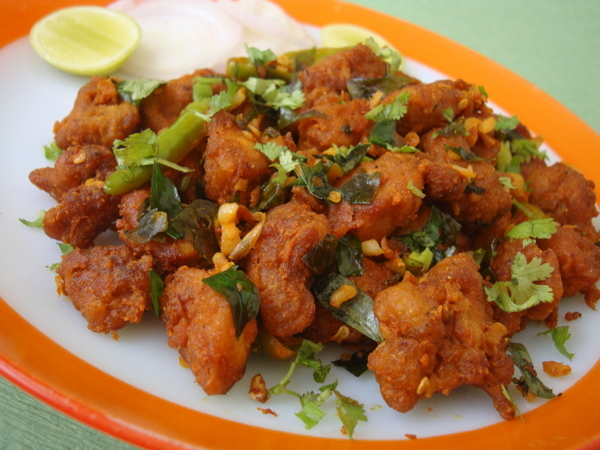 what about chicken Manchurian ? What on earth is it ? I used to eat quite alot of that aswell , but as far as I know Manchuria is in China ! Nice though ! sairam ,I always used to have chicken 65 when in my favourite watering hole in Bangalore , as a snack with my Kingfishers and I did sometimes wonder what it was and where the name came from , very tasty though , thankyou for the recipe , I will try it myself now I am back in London. Also, could you give us all a recipe for sambar as they make it in Puttaparti , and one of the best dishes I’ve ever had ; cabbage thoran ,from down in Kerala ? Thankyou ,I was getting homesick just looking at some of the photos ! SAIRAM. Thank u Sailu…truely nice recipe! corn flour is the corn starch or the actual corn flour( makai ka aata ) which is yellow in colour. can u please help me. in us i got yellow corn flour (makai ka atta) which is yellow in colour. can u suggest i should use this or get corn starch.which is better.please suggest. Thank you. This tastes better than the ones made from pre-made masalas. Made this today and it came exceptionally well..U know this is my second time cooking with chicken as i don’t know cooking at all…U know the dish came out so well and my wife said…Better u cook from today..thanks a lot once again..
Can you refresh the page and check again. If you still cant view the recipe, pls leave a comment. Thanks Sailu.. I love this recipe…I tried once it came out very tasty. Sailugaaru I’ve seen so many different versions. Most of them did not include yoghurt. I would like to know after which step can i pan fry the chicken instead of deep fry… Will the chicken be of the same texture as u got when deep fried if we pan fry it? I mean, when we add egg and later pan fry it, will it be same as deep fry? At step 4, you can add 3-4 tbsps of oil and shallow fry few pieces in batches. Fry on low flame and once its almost cooked, increase flame and cook till fully cooked. You shouldnt have issues with regard to texture. Thanks a ton!…chicken 65 was a hit! I’m sure I’m gonna try more from sailu’s food website. I tried but did not come well. Dont you know good receipe ? Hi Sailu. Is there any standard measurement of salt that you use for chicken dishes? Say for 1/2 Kg Chicken Kabab or 1/2 KG Chicken Gravy?